Stormwater is the only major source of nitrogen pollution still increasing in the Chesapeake Bay watershed. CBF is introducing local Bay jurisdictions to a new way of financing green infrastructure for stormwater management, called "impact investment"—and its additional benefits, such as creating local sustainable jobs and more healthy, vibrant communities. 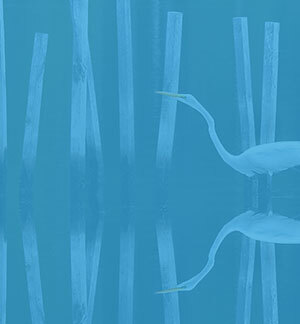 Chesapeake Bay watershed municipalities face challenges in meeting federal and state Clean Water Act requirements and managing compliance with consent decrees—particularly when it comes to financing solutions. Working with impact investment advisory firm Quantified Ventures, CBF is providing pro bono support to municipalities and water utilities seeking funding for stormwater management and related resilience projects. Quantified Ventures introduced the first-ever Environmental Impact Bond with DC Water in 2016 and is now working with cities across the U.S. to help them tap into impact investment for environmental projects. benefit from understanding the efficacy of projects funded by the bonds, thereby informing future investment decisions. Today, we have a new generation of investors that cares as much about social and environmental returns as they do financial ones. These “impact investors” are seeking financial, social, and environmental returns on their investments. CBF wants to help municipalities leverage this new source of capital to create green infrastructure (rain gardens, permeable pavement, bioswales, and more) that can help reduce stormwater management burdens. 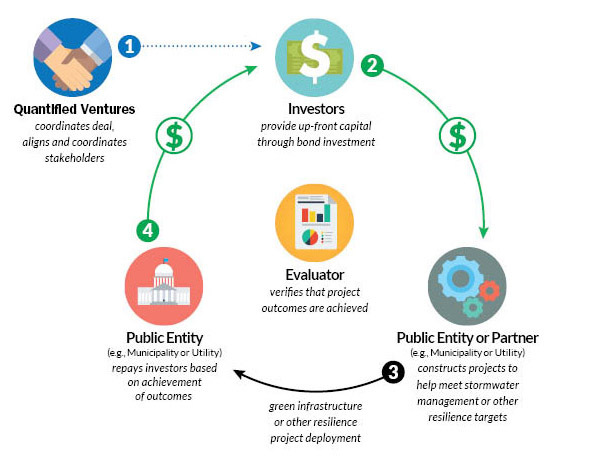 The Environmental Impact Bond model matches impact investors with municipalities planning environmental resilience projects such as green infrastructure. Investors provide up-front capital and share the project risk. Environmental Impact Bonds provide public entities up-front capital for environmental projects. Bond investors are repaid based on project success. Quantified Ventures works with municipalities to bring the necessary parties together and determine the parameters of the Environmental Impact Bond, including interest rate, timeframe, outcome metrics, and more. A municipality issues the Bonds and sells them to private investors to finance environmental capital projects. The municipal issuer then uses this funding for green infrastructure solutions. The entity is required to pay interest on the bonds and to repay the principal amount of the bonds on scheduled payment dates. At the end of an evaluation period (for example, five years), the municipal issuer pays the investors an outcome payment if the project performs better than expected and the investors will pay the municipality a risk-sharing payment if the project underperforms. CBF is looking for innovative municipalities and water utilities in Pennsylvania, Maryland, and Virginia to partner with on a pro-bono basis in adopting the Environmental Impact Bond model to finance green infrastructure projects. We will help selected jurisdictions and their advisors structure an Environmental Impact Bond issuance or similar “Pay for Success” model tailored to your community's financial and environmental needs in order to realize green infrastructure solutions. Watch a recording of our most recent webinar to learn how our community might benefit from EIBs. Sign up to receive email updates on this pro-bono project from CBF and Quantified Ventures. The Green Infrastructure Environmental Impact Bond project being conducted by CBF, with our contractor Quantified Ventures, is funded by a generous one-to-one grant from an anonymous donor that is being matched in part by The Kresge Foundation and The Abell Foundation. NO FEES WILL BE CHARGED BY CBF OR QV FOR THEIR PROGRAMMATIC SERVICES. ALL OTHER EXPENSES MAY APPLY, INCLUDING RATING AGENCY, BOND COUNSEL, INDEPENDENT REGISTERED MUNICIPAL ADVISOR, AND EVALUATOR FEES AND SUCH FEES SHALL BE PAID FOR BY THE APPLICABLE MUNICIPAL ENTITY. NEITHER CBF NOR QV IS RECOMMENDING ANY ACTION TO ANY MUNICIPAL ENTITY. THE INFORMATION PROVIDED HEREIN IS NOT INTENDED TO BE AND SHOULD NOT BE CONSTRUED AS “ADVICE” UNDER SECTION 15B OF THE SECURITIES EXCHANGE ACT OF 1934 OR THE MUNICIPAL ADVISORY RULES OF THE SEC AND MSRB. CBF AND QV ARE NOT AND WILL NOT BE, ACTING AS AN ADVISOR (WHETHER FINANCIAL OR MUNICIPAL), AGENT OR FIDUCIARY TO ANY MUNICIPAL ENTITY AND CBF AND QV WILL NOT HAVE ANY ADVISORY, AGENCY OR FIDUCIARY DUTY TO ANY PERSON PURSUANT TO SECTION 15B OF THE SECURITIES EXCHANGE ACT OF 1934 OR SECTION 975 OF THE DODD-FRANK WALL STREET REFORM AND CONSUMER PROTECTION ACT. CBF AND QV ARE ACTING FOR THEIR OWN INTERESTS. MUNICIPAL ENTITIES SHOULD DISCUSS ANY INFORMATION AND MATERIAL CONTAINED IN THIS COMMUNICATION WITH ANY AND ALL INTERNAL OR EXTERNAL ADVISORS AND EXPERTS THAT THE MUNICIPAL ENTITY DEEMS APPROPRIATE BEFORE ACTING ON THIS INFORMATION. Under the federal Clean Water Act, municipalities are required to address polluted runoff and antiquated sewage systems—some of which dump sanitary waste and raw sewage into local rivers and streams when moderate to heavy storms hit. Meeting clean-water goals in cities, towns, and urban counties is often difficult and expensive. Polluted runoff is a major source of pollution in the Bay that is still increasing, causing from 17 to more than 20 percent of the nitrogen pollution to the Bay. Newer runoff management techniques that address these issues include so-called green infrastructure, such as vegetated trenches, green roofs, and raingardens that mimic natural processes, may be more cost-effective, and can provide other community benefits. But because of unfamiliarity, these practices may be seen as riskier and more difficult to finance.